This topic contains 15 replies, has 3 voices, and was last updated by Trevor R 1 month, 2 weeks ago. The variant of this is i am trying to use a Gann Swing Chart overlay as the starting and end points. 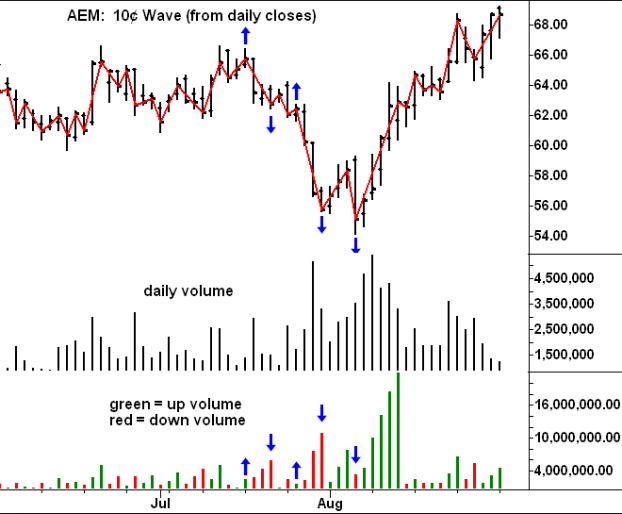 The script attached is initiating accumulation of volume from the signal start but is not switching at signal end. Glad it is the sort of result you were after. Defining the swing range is easy. What proved very challenging was aggregating the volume from the first bar after the SwingStart Bar (Top or Bottom) and including the SwingEnd Bar (Bottom or Top). I didn’t what to count the bar at the turning point bar twice. I suspect the issue is that the Gann Swing Starts and Ends get too close together for the TimeSinceSignals to do their magic, but I haven’t dreamt up a fix for that. Fortunately it probably is not too significant on Daily Bar charts with 1 and 2 Bar Gann Swing Overlay, but become very significant on Weekly Bar Charts where, depending in the market, a large number of 1 Bar Counter Trends may be evident. 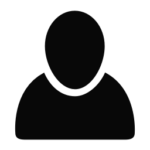 As for Optuma Scripting assistance search the Optuma Knowledge Base for all the articles on scripting. If you haven’t worked through them already, I’d strongly suggest you study the Optuma Scripting Courses – they are FREE! thank you for your script and it works. Unfortunatelly the outcome is different vs wyckoff. The image seems that every time there is a negative close start a new count with new bar. Please explain exactly what you mean by “some important difference”, especially as some of us reading your post, including me, have not studied Wycroft’s methods in sufficient depth to identify those differences as you see them. The script as presented, by my viewing, is doing exactly as previously described in calculating the accumulated volume following each Gann swing top and bottom to the subsequent swing bottom/top, subject to the caveat of possible anomalous results following 1 bar counter trends and outside bars. If you wish to calculate the accumulated volume without using Gann Swing tops and bottoms, then you will need to clearly define very precisely the Top/Bottom the criteria to establish the signals from which to commence and end the volume calculations. The scripting PIVOT function might be one approach, but I leave that for you to explore. thank you for your replay. I try to give more detail. a) if closing price is positive, than volume is green; if next bar the closing price i positive that volume is green and it added to previous volume bar, so it is a cumulative volume. B) if the closing price is negative, than the previous volume (green bar ) is stopped and new volume bar (Red) start to show in the chart; if the next bar continue to show negative price action the volume is added. 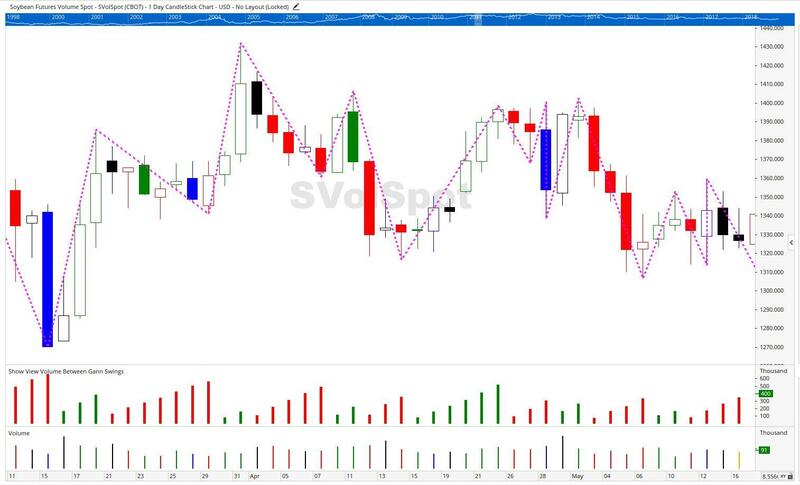 In this way volume indicator is correlated with closing price action. I hope that this will help you to understant it better. Really apologize for my bad english. I’m looking to find a correct explanation but at the moment i didn’t find it. 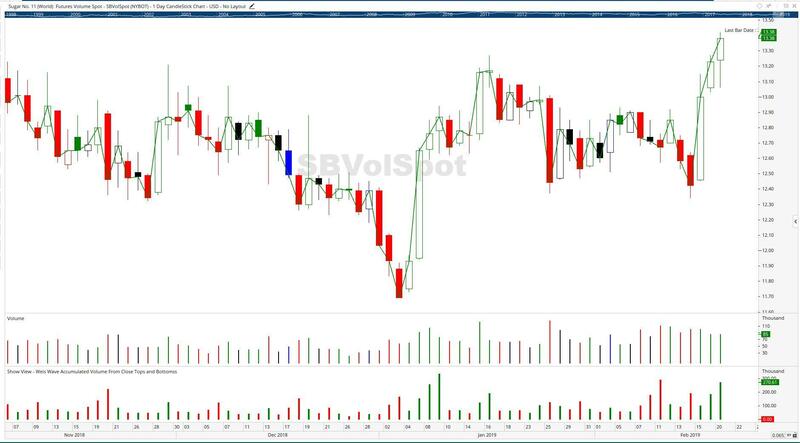 From a Close Top, ie a Bar Close that is higher than the previous Bar Close and succeeding Bar Close, add the Volume of each Bar after the Close Top until, and including, the volume of a Close Bottom. I trust I’ve understood what you were looking for. as you can see I have compared the two charts, the original one and the optuma chart. 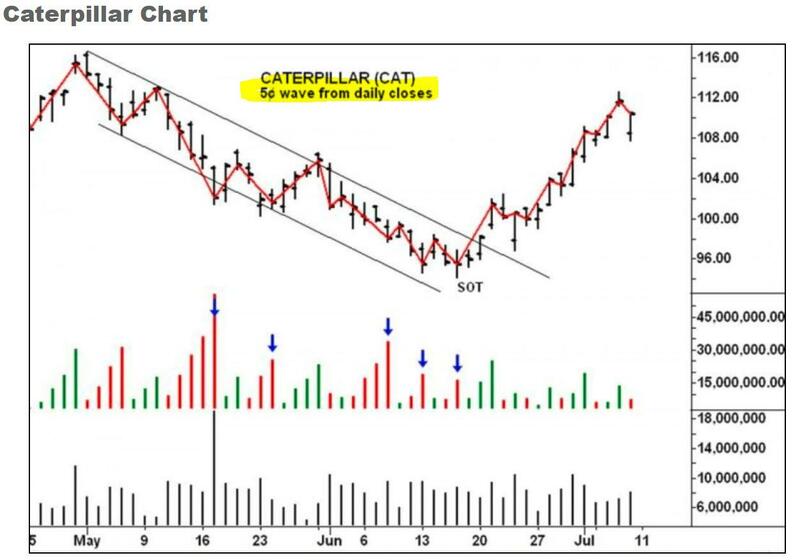 The chart is of Caterpillar in 2011 spring. As you can see there are two difference. B) but more important there are difference on indicator. 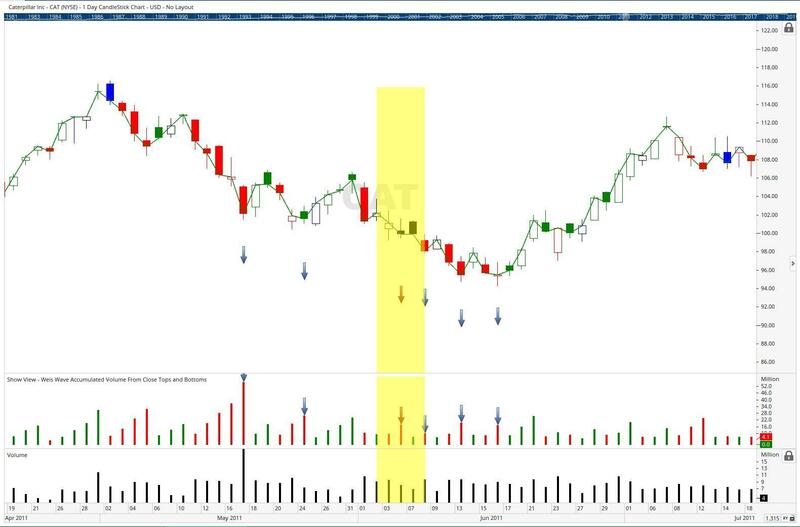 If you look a 18th May Caterpillar show a reversal price, so the wise indicator switched from red cumulative volume, to new green volume. The use of OHLC Bars or Candlesticks and their colour scheme is one of personal preference. I happen to like Candles with Optuma’s “Swing Relations” colour scheme. It’s up to you how you colour your charts. Below is the Caterpillar chart from https://weisonwyckoff.com/weis-wave/ and my chart of the same period with my script applied. You will note that at 17-18-19 May 2011 the charts are the same. That, however, cannot be said for the period 3 to 9 June 2011 (yellow highlighted) and the reason for the difference is explained below my chart from Optuma. The difference in the volume aggregation during the period 3 to 9 June arises, I believe, from a further limitation included in the application of the “Wies Wave” in the top chart. On that chart I have highlighted the comment “5¢ wave from daily closes”. I interpret this to mean that the difference between successive Closes must be at least 5¢. This limiting criteria is not addressed in the script I presented previously, which considers that the a minimum price movement can cause a change in trend. I’ve ignored this limiting criteria because it will be different for different markets, as can be seen in the various charts in the referenced article, eg 0.0003 pip in the case of EUR/USD, 0.75 Point on S&P and 10¢ on AEM. My script can be applied universally, whereas those varying swing limiting criteria would require separate scripts embodying their respective limiting criteria for each market. I leave it for you to amend the scripts to meet your specific requirements. it maybe there is some settings that doesn’t work. I used Candlestick with Swing Relations, but the indicator is Always red. And i can’t understand why, do you have any ideas ? It looks like I copied a development version of the script in my earlier post – one could call it a “scripting challenge”. Apologies for the confusion.